The africrops! 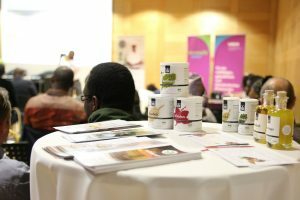 approach was met with great enthusiasm at the 2nd German-African Diaspora Conference - africrops! Dr. Wesselmann during his presentation of africrops! Our managing director Dr. Andreas Wesselmann recently travelled to Dortmund to present the business model of africrops! at the 2nd German-African Diaspora Conference. The conference was organised by the Association of Cameroonian Engineers and Computer Scientists (VKII) and gave experts from various institutions the opportunity to discuss the United Nations’ Sustainable Development Goals, their implementation and significance for development here in Germany and in Africa. This year’s conference focused on the SDGs aimed at the elimination of hunger (SDG 2), gender equality (SDG 5), clean water and sanitation (SDG 6), reduced inequalities (SDG 10) and sustainable cities and communities (SDG 11). During a discussion round on “best practices”, Dr. Wesselmann explained in detail the africrops! approach and the cooperation possibilities with farmers in Africa. He also outlined the necessary framework conditions that need to be met locally in order for the business model to work and establish long-term business relationships. In many African countries, agriculture is rarely perceived as a profitable economic sector that can generate a sustainable income. 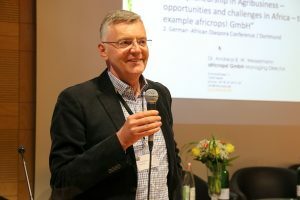 Our aim is to change this perception and conferences like this help to achieve a shift in the mindset of the audience: immediately after the presentation, many of the participants approached Dr. Wesselmann and expressed their interest in working with africrops!. Concrete ideas for new projects are now being developed. Please find more information about the conference here.